With a west-east migration in the works, I’m giving this little compact device the opportunity to prove herself while I’m still at home. I just went through and documented all of the Al Purdy poems that will be subjects for paintings in September. (Dang! I already wish I had a larger keyboard!) Anyway, there are still projects to organize, so this won’t be long. A test is all. Hmm mm now,seeing if I can attach a photograph? Something unrelated, I’m guessing. Alright. So it appears that I can’t up load images taken on the device and stored in the album. I’m going to have to do something about that! I really really like WordPress! In minutes, I was on live chat with a support person (I think they call them happiness engineers) and Jason explained how to download the WordPress app from the Playstore. And so, I’m going to try to post a second photo, this one, from my tablet. I’ve now got this sorted out and that’s one more accomplishment before getting on the road! I’m sorting things out, in order to spend time with my father in the east. The Christmas cards for 2015 are in the mail. Doctors appointments, Max’s grooming, the vehicle checks and household chores are now being tackled. The past week has meant a lot of beautiful indoor time with booming thunder storms every afternoon. I feel like I’m on a retreat because the house is so quiet…just Max and me. I can eat popcorn whenever I want. In the evening, a glass of red wine. Last night, I baked salmon in parchment paper…fresh lemon squeezed over the beautiful pink meat. Every ritual seems lovely and intentional. For the most part, it’s been productive and satisfying. I’ve decided that my pond study will wrap up the morning of Mom’s birthday, July 27. I’ve walked the circumference of the pond at Frank’s Flats every day since October 13,2015 with the intention of taking a single Instagram photograph of a single location, a bush that grows at the pond’s edge. I have seen it through the seasons and watched how light changes everything. I’ve developed rituals around these observations, recording, writing captions, creating mental sketches and noting the changes in the animals and vegetation as time passes. I’ve much reference material now and in the autumn, I want to create a response to all of it. I’ve had some faithful followers as, for most of the experiment up until July, I’ve documented on social media (Facebook) as well. Yesterday, at the pond, I observed the only two Ruddy duck babes, alongside Mom. The teen-aged Coots and Grebes are now taking diving lessons and doing so very successfully. Mr. and Mrs. everything are swimming further and further from their youngsters, although the teens still cry out helplessly and give chase, not wanting to be separated from, at the very least, their source of food. With the horrendous amount of rain recently, I fear that the Ruddy ducks’ nests have been drowned…the two babies that I observed, came to be only days before the first thunderstorms hit, so I’m guessing all of the other mothers were sitting at that time. I’ll see. I think that flying lessons are beginning…I notice that the adult Coots, while remaining on the water, are flapping hard and traveling on the surface. While I stopped putting out seed at my feeders (as a way of settling down the vole and mouse populations), I got emotional when I realized that Mr. and Mrs. Sparrow, in the vent across from my kitchen window, were trying one more time to nest. The children are crying ravenously with each entrance to the vent from Mr. or Mrs. I just need to see this family have a successful season, after two former attempts. The crows are big raiders in this neighbourhood these days, as those adults also struggle to feed their demanding young. As I reflect upon the last while, I continue to feel gratitude…especially for the lessons of nature and of solitude. I like slowing things down. I’ve been particularly inspired by a poem by Al Purdy, titled Detail and so I will post it here, along side a few photographs that I snapped yesterday. In 1981, when doctoral work was typed on typewriters…Elizabeth Jane Douglas wrote a thesis titled the Mechanics of Being Alive: Major Themes in Poetry and Prose of Al Purdy. This absolutely impacts my past year’s ‘work’ and ‘reflection’. And then, there are those of us who believe that beyond this, there is so much more. But for now, I leave this reflection. I have a border collie, eager to run in the green wet grass. Prayers for Billy and his family and for little Taliyah Marsman and her mother and their family. I was driving home from Mass this morning and heard Joan Baez on CBC radio, singing a tune written by Steve Earle that appears on her most recent album. She is 75 years old. I think that the timing could not have been more perfect. This morning’s focus…the story of a Samaritan, the least likely to stop and help some one who was different from himself…and yet, he was the one who stopped and assisted the man robbed and beaten and left on the road to die. Good thoughts on a new day. Three days now, I’ve been deactivated on the most popular social media website since sliced bread. I document my father’s music in the hours I might have wasted on early mornings, while drinking my coffee. I listen to Chris de Burgh music on Youtube as background, while reading Al Purdy poetry. His words make me weep at times. I would have posted that on Facebook. I imagine filling in that small space…I don’t even remember what the prompt was? Say something about yourself…or what you are doing…what came to be known as a status update. I would probably post a link to this post. As a way of weening myself from the process, I thought to update my status here…what would I say? July 5, 2016 A dark cloud fell upon me when, from no where, a friend invited me to go chase dark clouds. He parked his car across the street and magically appeared when I needed a friend. July 6, 2016 My hair was dirty, so I didn’t join my girlfriends for a night of listening to live music. I didn’t paint at Rumble House, again. I read Al Purdy poetry and used a sock as a place-saver. July 7, 2016 I feel sad that I’m seeing the changes in the pond, all on my own, and that no one else sees exactly what I see. Mr. and Mrs. Sparrow are trying to raise another family in the neighbour’s vent. I relent and put seed in the feeder that I had pulled out of service because of the growing population of voles. But, now, with the children’s incessant cry for sustenance, I give in. July 10, 2016 What does it mean that I have 13 hits on my blog from Macau SAR China, today? Some times these connections, through writing, just surprise me. Yesterday’s photographs…documentation of train graffiti, imagining that the artist would want to know where his art had traveled. It’s been wonderful to see the great Cormorants coming through. They are closer to the river…this, a lone female. Youngster…sitting a short distance from Mom…about half her size. A herd of 20 geese, four adults and the rest, progeny, slip into the water as Max and I tippy toe through the goose poo. Dang! I wanted to document each and every monthly angel, with its creator, Alvise Doglioni Majer. This time I forgot. We had lots of creativity to talk about, though, and the minute I saw her, I was smitten by July! Thank you, Alvise. She has now officially joined the other ladies in the Journey Around the Sun series. The summer critter to be represented is the honey bee. Alvise has two hives on his property now and will expand to four next year. I particularly enjoy the face, halo and wings on this angel. She has a bit of a summer tan. I’m enjoying a bowl of beef barley soup on this rainy chill of an afternoon. I’m glad I got out to the pond this morning…so sad, however, to find that pesticides were being sprayed in an area where young geese were feeding and the other birds were still busily harvesting worms surfaced after yesterday’s rain. I just don’t understand why we are not more invested in caring for delicate ecosystems. Why would the pristine turf of a sports field take priority? The city of Calgary website explains that the presence of broadleaf weeds is a tripping and safely hazard. But…I digress. I’m praying for the conversion of the human heart, in so many ways. I’ve wanted to take my daughter and son-in-law up to the Cirque for a few years and it finally happened. I also wanted to be with my hiking friend, Cathy, who has such a natural and beautiful connection with the mountains. And gratefully, friend, Michael, could also join us. So, we took our pot luck and headed up Longview direction. A bit of a late start, we got on the trail just after the first explosion of hail in the parking lot. The hike held some really fantastic moments. I was in bliss at the beautiful showing of wild flowers. Everything seemed more lush because of the moisture. Forget-me-nots blooming, electric blue, next to yellow flowers, made me think of Mom. Pink paintbrush, wild asters, Queen Anne lace…what a show! The smell of the air…glorious! The company…the people I was with…fun and patient and willing. Weather…dramatic…frightening at times, but contributed to a different experience of these towering mountains! Thunder booms in a bowl of tall mountains are just somehow, different! Apart from two Instagram shots, I didn’t archive any of this, but will post the collected photos here. To begin…images from my first hike up Ptarmigan in 2010. Yesterday’s Archives, beginning with our drive to Longview. 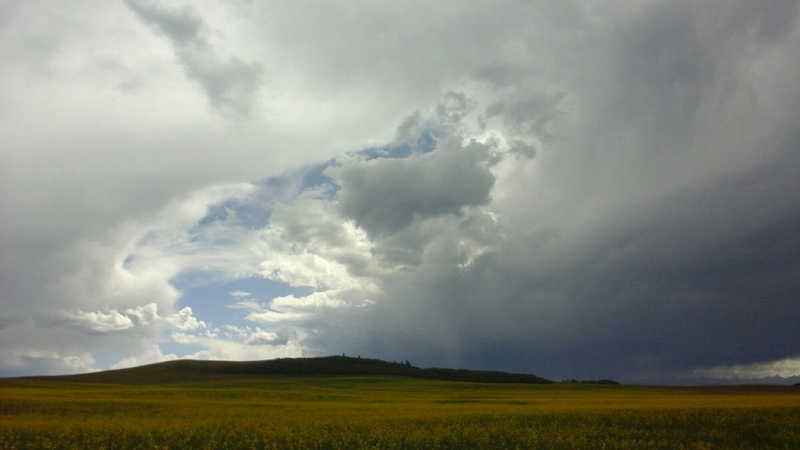 Canola field…candy purchase at the corner gas station in Black Diamond…the chat that goes on between friends, heading for the mountains. Michael Collett…the artist snapping the shot. Also, Michael’s photograph…an opening view from the trees…stops and starts of rain by this point. My two little Instagram shots…Cathy ahead of me on the shale traverse. The meadow…rich green always awes me. Cathy’s phone…she captures…or attempts to capture the flowers in the meadows. We both agreed we have never seen them like this. Spectacle! This photograph speaks for itself. We’re in mountain bliss at this point. But, what of the others? Here are Doug’s photos…Michael seems to not be represented well in this set of photographs. He is an intense explorer…likely observing light and colour! I love the artistry in Doug’s photos…the image below, I guess, shows scale. lol Erin and Michael coming down from a wee jaunt they did on a higher trail. This one shows the glory of it all. Proud of my son-in-law, Douglas…a great way to celebrate Canada Day weekend! We made it to the parking lot…a tad wet, but very satisfied! And the drive home…no less magical! We stopped at that canola field. The drama of the evening’s sky evolved as we headed toward the city. This is Michael’s photograph. I’m a single woman in the world. If I think too much about it, I can get sad about that…the fact that I don’t have a life partner, helping me reach the things high in my cupboards or rubbing my back when I get the pukes. Truth is, I realize how grateful I am for my children, my son-in-law, his family, my family near and far and my dear friends who are always there with their thoughts, ideas, tremendous support. I don’t know what I’d be without them! Thank you.